Paint a portrait of your pet at Project Pet or create a great gift for a loved one, family member or treat yourself! 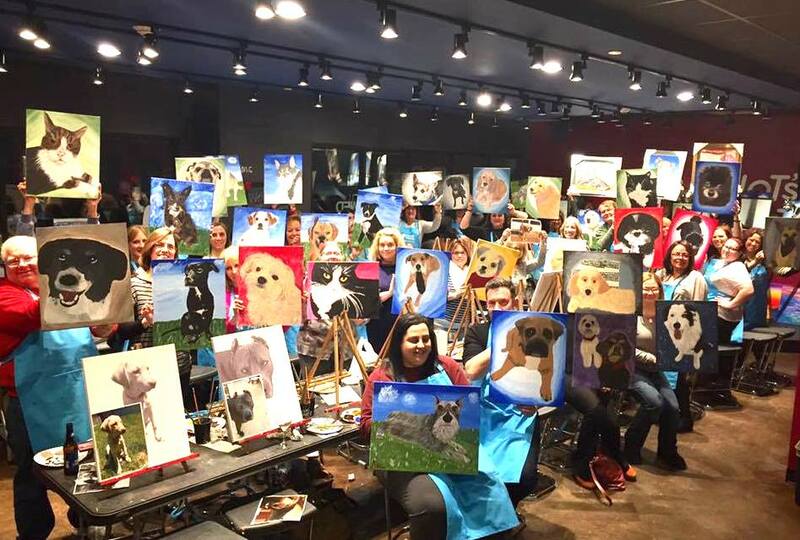 Once you sign up for the painting, email us a high quality digital photo of your pet to bayshore@pinotspalette.com (one pet per canvas, please) and we will do the rest! Each photo will be transferred onto a 16”X20” canvas. Our talented artists will walk you through the steps to create your very own Pet Portrait! All pets welcome: turtles, horses, cats, dogs, bunnies, hamsters....even paint mom or dad's pet as a personalized gift. PHOTO DEADLINE 10/1 at that date this class will close for registration. Must send photos by 10/1 to receive high res photo of your pet in time for class. Please confirm your first name, last name and email to best communicate with you. The best portraits are a little closer in and high resolution, i.e. not a scanned photo but rather a photo from your cell phone. Any photos sent after the photo deadline will not be printed and your reservation will be refunded. After photos are submitted class can not be refunded only rescheduled with 48 hours notice. Sold out classes subject to $10 rebooking fee. Address of class 61 W Main St. Bay Shore NY 11706 (off main street on a side street known as park ave, huge municipal parking lot alongside our studio, avoid numbered stalls for free parking). Paint. Drink. Have Fun! d) Pet is centered in the photo either FULL BODY or HEAD SHOT, with no cropped off edges. f) Remember, the better your photo is, the easier the painting process ...but yes if all you have is a scan/pdf or pet since passed on send us that favorite photo and we will do some photoshop magic! Makes a great surprise gift! Sorry No Discounts or special rates apply to this class.